Monty Davis is a farmer, writer, entrepreneur and Ag promotion specialist who is committed to protecting and promoting agriculture through Agri-tourism, public relations campaigns, public education, private investing, conservation planning, policy writing, public speaking, farm tours, online media, job recruitment and fundraising. As a young boy, Monty raised every baby farm animal you can imagine and has a deep love for animals. There is a certain peace and serenity Monty loves when he’s hauling hay, weeding the vegetables as the sun goes down, or enjoying the stars while irrigating through the night. Monty’s love for agriculture and entrepreneurial spirit has led him to start several farming operations. He partnered with his brother to start Wasatch Livestock & Hay LLC, an online livestock auction and hay brokering company. Unfortunately, that company came to a halt when Monty was in a near fatal auto accident in 2009. 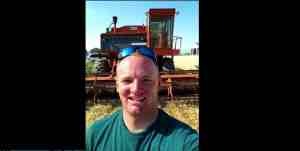 After being out of agriculture for a long time, he couldn’t stand not being involved in farming so Monty started an online magazine and Ag promotion company called AgriUtah. He started the Utah Ag Leader’s Council which helped fight the building of a major freeway through some of Utah’s best farm ground. Monty helped successfully write and pass the first free standing Agri-tourism ordinance in the country giving farmers another avenue to make money and keep the family farm going. Goal driven and not wanting to see farming die in America, Monty has several goals to accomplish in the next 10 years. • Hosting annual classes about food preservation. 1. Please share with us what prompted your creation of Little Weber Farms? Monty: I have been involved in agriculture all of my life growing up on a 100 acre family farm. Farming isn’t just a job to me; it’s a passion. I am heavily involved in promoting agriculture in Utah and help write Ag friendly laws and ordinances. I found a niche in the CSA (Community Supported Agriculture) format of farming and took a leap of faith to see if I could make it work. I originally wanted to raise pastured chicken, but didn’t have the capital to build my own processing plant so for now I’m raising pesticide & GMO Free produce. Monty: Very busy. It’s never the same, but it usually starts with a Facebook post on the farm Facebook page, follow up on suppliers to see when my order will be shipped, texting my employees on what I need weeded for the day, talking with my designer about new marketing campaigns, working on farm equipment, planning crop rotation, scheduling deliveries, watering through the night and lots of praying. Monty: Honestly, I use Excel for about everything. On my phone, I love the Android widget full-size calendar. I’d be out of business without the reminders on my phone. Monty: I think it’s important to prioritize and have to do lists. That is why I love my Android it helps me stay focused. When you have 100 things to do it can be overwhelming. When I break it down day by day it’s a lot easier to focus on what I need done most. There are no 40 hour work weeks being a new business owner. 80 hours is a normal work week and you have to be willing to put in the hours to get your business off the ground. Monty: I think the best advice I got was to get rid of my critics. Humans naturally hate to see others succeed. I don’t talk about my farm to anyone that doesn’t believe in farming or think you can make a living at it. I surround myself with people in the industry and other entrepreneurs that know what it takes to be a business owner. 6. Given the current economic climate, what has been your strategy for building awareness of Little Weber Farms? (what you do for short term and long term growth)? Monty: The nice thing about being my farm is that there is a “cause” associated with it. We have been really successful with social media and networking with other farmers and public officials. I traveled the state with my company AgriUtah interviewing farmers, public officials and writing articles about virtually everything in agriculture: start-ups, education, Ag laws, social issues, etc. People want fresh, local, natural food so social media and word of mouth has done a lot to get our name out there. Monty: This may sound funny, but my biggest achievement is actually having the courage to start my farm. Starting a farm from scratch cost an enormous amount of money and I was discouraged by almost everyone to not start a farm. I have a passion for it and I believe you excel at things you love. I should have done what I’m doing now 10 years ago. I love it, I’m good at it and we are growing at a very healthy pace. Monty: Balancing work and home life is probably the biggest obstacle. There are always things to do on the farm, but I have little kids and a wife at home that I want to be with. The nice think about the farm is that my kids help me all the time. My 5 year old can drive a tractor and absolutely loves farming! Achieving balance is simply setting your priorities straight. Farming is my passion, but my family is my life. If I have to quit so I can be with my family and then go back to the farm after the kids are in bed then that’s what I do. I don’t want to miss my kids growing up. Monty: My top 3 book recommendations would be the 7 Habits of Highly Effective People, the biography of Ben Franklin, and the Winter Harvest Handbook by Elliot Coleman. Monty: Right now, I’m helping the Utah Commitment to Agriculture Foundation with their annual fundraiser. This foundation gives out scholarships to FFA students every year and it has been a lot of fun. My other company, AgriUtah, sponsored a benefit for a kid I went to high school with who was in a really severe auto accident. I rented out a local rodeo arena and his friends held a barrel racing competition for him and all the proceeds went to helping him pay his medical bills. It’s always fun to help buy an animal at the annual Jr. Livestock Auction as well. I love teaching kids about agriculture and love anything that has to do with promoting agriculture or teaching the general public about farming. Monty: Where would any of us be without our parents? My parents have always believed in me and encouraged me to do what I love for a living. I had a neighbor, Marlon Winger, who now works for the NRCS (division of the USDA) who encouraged me to go into farming full-time and do what I love. Monty: Surround yourself with like-minded people who aren’t afraid of risk and who believe in your idea. There are a lot of farmers, especially the old timers, who don’t believe in farming the way I do. I have networked and become friends with open minded farmers that believe in farming the old- fashioned way. I don’t use a lot of big equipment, I don’t use any chemical fertilizers, no pesticides, no GMO seeds and I build my soil through composting and getting the right microbiology back in the soil. Every entrepreneur needs a cheerleader. It’s tough work and it takes a lot of mental strength to take the risks that you must take to be successful. Your spouse has to be there for you and be on board. The more cheerleaders you have, the more people you have to lean on for advice or to help you figure things out.